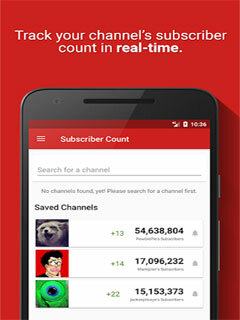 The official 'Realtime Subscriber Count' app allows you to view your YouTube subscriber amount in real-time! In version 7 we introduced our new 'Analytics' feature. This feature allows you to view detailed analytics for every channel on YouTube! Just search for the channel and click on the Analytics tab. You can see the channel's daily subscribers, daily views, monthly subscribers, monthly views and estimated earnings! 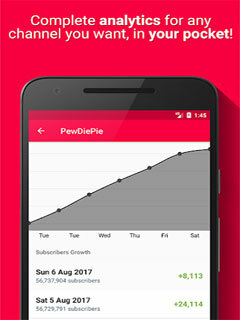 We're the only subscriber count app which contains widgets from the beginning, which makes us one of the most unique subscriber count app on Android. Just hold your finger on your homescreen and press Widgets to add one! 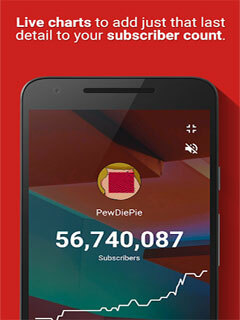 Realtime Subscriber Count also offers you very unique features like a fullscreen subscriber counter with sound effects, a quick settings tile in Android 7.0 and up which allows you to see your subscriber count very quickly and easy to use app shortcuts to directly open channels by clicking on a shortcut (only on Android 7.1 and up)! Realtime Subscriber Count contains so many features it's not just a mainstream subscriber counter. 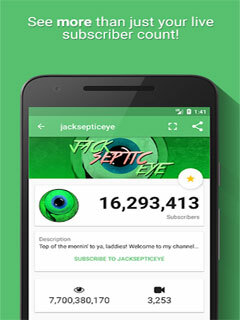 It allows you to save your favorite channels so you can always take a quick glance at their subscriber count by just opening the app! You don't even need to click on anything, just open the app and you're done. It is very easy to find your channel, just open the app, fill in your channel's ID or username and press search, oh and by the way, copy and pasting complete URLs will work too! It will then retrieve your live subscriber count in no-time! We're the only subscriber count app with a rating of 4,5* with over 27.143 reviews (est. on 8/7/2017) and 1.3 million downloads, and counting!